All of Provincetown is in on the celebration as you walk the historic streets and enjoy the festivities of the season. Throughout the month, look for special events such as Provincetown Men’s Weekend (November 10-12) and Mr. New England Leather Weekend (November 17-19) as well as bountiful menus filled with seasonal delights in town bars and restaurants. For a complete list of what is open each day, the Provincetown Business Guild has setup a special daily list. 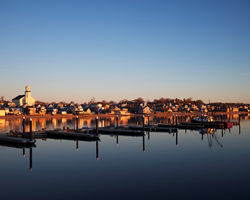 Getting to Provincetown this November is easier than ever, with an extended ferry season. Weekends are now in service from Bay State Cruise Company. Air travel is also available on a regular basis with regular flights from Cape Air. The celebrations continue into December with one-of-a-kind holiday, shopping, gatherings, shows and the final celebration of the year, First Light. and the annual Inn Stroll.